Getting Married? Here are 5 Ways to Budget for Your Wedding! Q: I’m ready to tie the knot, but I don’t know if I can afford a wedding! How can I cut costs without compromising on my special day? A: You don’t need to skimp on the wedding of your dreams or go deeply into debt to pay for it. By planning ahead, choosing wisely and prioritizing what’s truly important, you can say “I Do” without stressing over wedding costs. Instead of waiting for that special someone to pop the question, start saving now! The average age of marriage is 27 for men, and 26 for women. 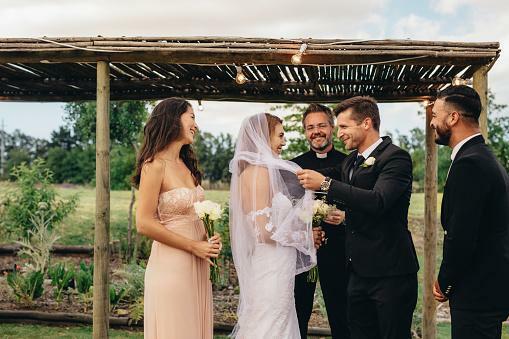 If you start saving for your wedding when you’re 20, you’ll only need to put away $333 a month. But, if you start at age 26, you’ll need to put away $2,333 a month! Open a savings account at MCCU to save for your wedding! Think off-season and mid-week, and you’ll save a bundle! First, consider a winter wedding. You’ll shave thousands of dollars off the venue price by choosing an unusual time of year to get married. Second, think beyond Saturdays. If you can find a venue with a vacancy on a Sunday, grab it! Venue prices drop dramatically with just a one-day switch. Save big on your gown by looking for a pre-owned gown on eBay, OnceWed.com or PreOwnedWeddingDresses.com. You can often find a beautiful gown for under $100! Save a ton by choosing a venue that has no outside contracts. This way, you can shop around for the cheapest caterer, photographer and DJ.